Welcome to Wingsical Whims Embroidery. Grab a cup of coffee, browse, enjoy and relax. My name is Paula. I have been a Minnesotan all my life. I love all four of the seasons, but I am a freeze baby. I have a wonderful husband, Lonny, (pictured with me) who I adore with my whole heart. I have four wonderful children, Tevin, Christina, Kayle & Amanda, who I am also very proud of. I also have a wonderful Grand Daughter, Georgi. I cannot tell you how much joy she can bring me. The name Wingsical Whims..............How did I come up with this you ask? My Angel Mother passed away in 1995, In the short time after she passed, I started cross stitching hummingbirds and buying everything I could that was hummingbirds. When I see a hummingbird it always makes me think of my Mom, so I wanted something I thought would resemble a hummingbird but not at the same time. I always think of the word "Whimsical" for some reason with a hummingbird. So I knew I wanted that word some how. Then I needed something with a hummingbird so I thought of the "Wings" So the word "Wingsical" was born. Wingsical just didn't seem to be enough so I spent a few days thinking and couldn't find a good fit, and then I asked my hubby and he right away said "Whims". The name was born: Wingsical Whims. Feel free to stop by my Facebook Page or the group and introduce yourself and show off what you have created with my designs. I love see what others do! If you have a request for a design, I do take those as well. Leave me a message on the Guest Book or come on over to Facebook and ask. Enough of my ramblings! Please stop by the Guest Book and let me know you were here! Have a wonderful day, night or afternoon! 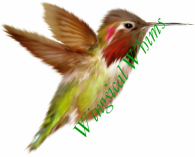 My Wingsical Whims Page on Facebook. My Wingsical Whims Group on Facebook. P's & Q's Computing. This is our Computer Store. We do both sales and service. P's & Q's Computing on Facebook. P's & Q's Computing on Pinterest.